Cameron Presentations has used a 20,000 lumen projector to help promote tourism to Croatia. Thye Edinburgh company projected images of the country onto a building opposite the city's Balmoral Hotel, using a Christie Roadster S+20K projector. The event coincided with a visit to the Scottish Parliament by Croatia's president, Stjepan Mesic. 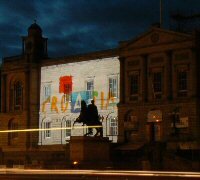 The projection used images of Croatia, its flag and the Croatian Tourist Board's branding and lasted from 1800 to 2030. Cameron Presentations rigged the projector (with a 32amp power supply) in a fourth floor hotel bedroom and projected a 20m x 15m image onto Edinburgh Council's Births, Deaths and Marriages office.